One of the strangest oddities in Islam is that Islam bans interest, both receiving and paying it. Prophet Muhammad probably took this rule from Judaism and continued it in Islam. He may have seen some harms caused by interest and decided to ban it outright, or maybe he wanted to add more credence and legitimacy to his religion by taking laws from Judaism. Either way, banning interest has led to many Muslims suffering and struggling their entire lives, living in mediocrity rather than excelling and building capital for their families. I am arguing here that Islam is bad for humanity, and in particular, this rule of forbidding interest is bad for humanity and harms Muslims that follow it. I will give actual financial numbers to show that interest actually can be beneficial, especially when it comes to renting vs. owning. So based on this statement and others, Sunni Muslims are forever never allowed to charge interest or pay interest. It also puts other limitations on them such as trading gold for gold on the spot, which will not be discussed here. But riba is not interest! Riba is not interest. That is correct. Riba is a bigger category and contains many different things, one of which is interest. Interest is categorically a form of riba. There is no way around it. When you trade money for money of unequal amounts without a product involved, you are involved in riba. There is a plethora of evidence online ad naseum that interest is riba is so I will not spend any more time proving it here. Yes and no. There are some forms of interest which are harmful. Excessive interest can be very harmful to individuals and society. Examples of this are short-term cash loans lent out by companies like CashMoney which can be as high as 30-80% (if you calculate it), as well as credit card interest rates (19-23%), department store cards (30%), as well as those rent-to-own furniture stores tend to be a rip off. I am in favor of putting limitations on interest, but not banning it outright. Sometimes societies are harmed by loans which bankrupt them and they can never pay them back. There are definitely some limitations that can be placed on loans in order for society to thrive. There are also many ways interest benefits a society, and I will describe one example here. In today’s modern world, interest being forbidden puts you at a huge disadvantage. This is what I experienced as a Muslim. I felt that the risk of getting Allah’s displeasure was too great to involve myself in riba, so we rented. We could not find a way to buy a home without involving ourselves in riba, so I continued to rent. We had a big family, there was my wife, my growing family of 5 kids living in rent. It’s worth the struggle to avoid Allah’s wrath! There are Islamic alternatives to interest based mortgages. The issue is that there is no need for such workarounds when the interest based model works perfectly fine in this case, as demonstrated in this article. Why use complicated workarounds for a system that isn’t broken? 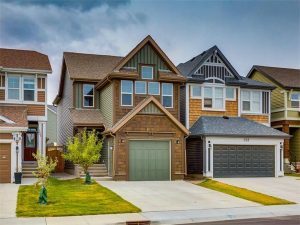 As a Muslim, I wrote an review on a company called Ansar Housing which offered Islamic based mortgages. You can read it at the end of this blog post. It is out of the scope of this article to discuss all the alternatives. The crux of this post is that the conventional system works well, and there’s no need for the rigidity of Islamic finance. Did you leave Islam because of not having a mortgage? No, of course not. I left Islam because I found the Quran to be false. Once I realized this, there was no issue in getting a mortgage. I would have gladly bore the difficulties of living without a mortgage if I had to because I wanted Allah’s pleasure and Jannah in return. Of course, if it’s all a lie, then Muslims are wasting their lives sacrificing for nothing. When I finally realized Islam was false, I decided to buy a house on riba. Here is how the math worked out. We bought a beautiful 4 bedroom 2500 square foot home and my family couldn’t be happier! Not my actual house, but a nice one. Is a mortgage bad for the bank? Is the mortgage bad for the bank? My mortgage interest rate is 2.5%. This is REALLY cheap, so how can the bank afford to loan the money at such a low price? Simple! The bank has access to cheap money, your bank deposits and other money that people trust them with such as GICs. Your property is valued and they have a lien on it so they can sell it if you don’t pay. In essence, the bank has very little risk and can give this win-win situation. They have low risk and you get cheap money. There is nobody losing here, it’s a mutually beneficial deal. Banks are happy and buyers are happy. I will explain how a 2.5% interest ends up making it almost guaranteed cheaper than renting, especially in the long run. So if riba is cursed, I have to ask, why? Who is losing here? Who is being harmed here? Who is suffering? In fact, nobody is being harmed, this is a really good setup, and it works well. Islam was made by a man who did not predict the way the world finance would evolve, and he did not realize that interest was not something that should be banned. So what this means is you will have to pay $2841 (significantly more than rent), but the interest is only $1300. The $1527 principal is yours to keep when you sell the home. It’s a sort of forced savings that you get back eventually! Now keep in mind, that even when I was paying $1650 in rent, I only had a small home that we barely fit in and hardly room to park our cars. 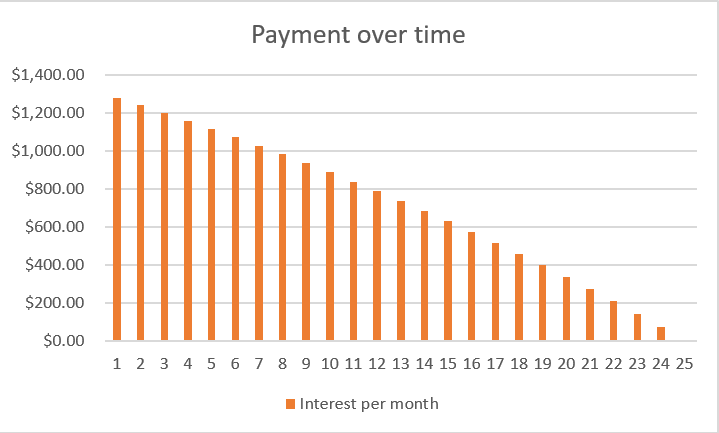 Let’s see how this interest payment reduces over time. Compare this to how my rent was actually INCREASING every year from 2006 to 2016! In year 5, I am actually only paying $1100 a month for the actual house! By the way, the total cost of ownership is a bit more, because you have to factor in property tax, maintenance, and hydro (which sometimes you pay even when you rent). For me, this is about $500 a month. The mortgage is a sort of forced savings. Since December 2016 I have paid off over $40,000 off my mortgage on top of the interest. This is insane compared to when I was renting I had nothing. This is all money that I will get back when I sell. Over the last 2 years, my home has increased approximately $200,000 in value. Yes, that’s right. If I sold the home now, I would have over $100,000 in profit that I could use for my kids’ education, travel if I so wished, and so on. No landlord can bother me about having kids issues such as writing on the walls etc.. If the kids damage it, I have to fix it myself. I wish all Muslims well and to consider the points above as an indication that Islam is a man-made system that is flawed, and that Muslims would do better to leave Islam and to live happy lives without any religious influence. My life has improved drastically after leaving Islam and I wish you also the same! And their taking usury though indeed they were forbidden. Please read these and other verses in Quran in context and understand. Great article. Many wise words, as usual. Showing the fatal flaws in Islam. Flaws that brainwashed Muslims will, of course, attack but have no real comeback against. Thank you. You make a very clear case on rent vs. mortgage, and why non-extortion levels of interest make a lot of sense. I’ve been looking for an example (numerical breakdown) contrasting a ‘halal’ mortgage versus a conventional western mortgage. I suspect that in the Islamic financing world, it’s really just interest by another name, when you look at all the inflows and outflows. However, I would like to demonstrate that with numbers (or have my suppositions challenged).